From Wikipedia: Parkour is a physical discipline inspired by human movement, focusing on uninterrupted, efficient forward motion over, under, around and through obstacles (both man-made and natural) in one's environment. Such movement may come in the form of running, jumping, climbing and other more complex techniques. 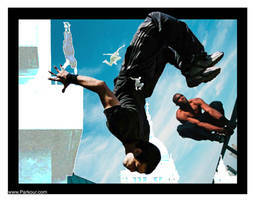 The goal of parkour is to adapt one's movement to any given obstacle. And I loved photographing him in action that day. Full view to enjoy the complete exciting experience. Apologies to those I have offended when naming this photo Parkour. I'm changing the title to avoid people flaming the mod that featured my DD, saying 'It's not parkour, it shouldn't be a DD'. Its an awesome shot , but is that really necessary? that is an amazing shot! great job and eye! one of the best parkour picture iv seen on here! you do have a really good eye! Assim nao consigo escrever no canal!!!! I flipped back a few comment pages and read that someone said that this wasn't "Efficient Forward Motion". Doing a triple back-handspring could be efficient forward motion if the situation called for a triple back-handspring to be done. Who is anyone to say that what he is doing in that picture wasn't the fastest way over? Maybe there was a car speeding at him out of the shot, and instead of going the other route around, he chose this route. No one can assume that much, even. Don't assume it wasn't efficient; only the Traceur himself and the photographer are apparent witnesses of this. As a Traceur, myself, this is a nice shot. His leg is a bit high up - I wonder how he landed it. Such a powerful jump, too. Woww.. great pic! I like how he's moving upside! Good for you and him! 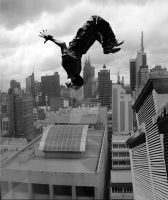 I love parkour and freerunning, I see a good athletic here, and a great photograph! If someone is saying 'this is Parkour' and 'this isn't Parkour', then I apologize. I personally happen to know that that IS Parkour, and is a very excellent example of the Speed Vault (albeit slightly exaggerated, but it makes better photography, no?). Yup, the exaggeration was merely for photography purposes I laid on the floor and everything! hehe. Thanks so much I really appreciate your comment. Not a problem at all. Feel free to check out me and my Parkour-inclined friends on YouTube under the keyword 'TR 33'. We are The Red Letters: TR 33. Id like to see more of this. Anywho, I found you through Teru. Im sure your arts will come out good! 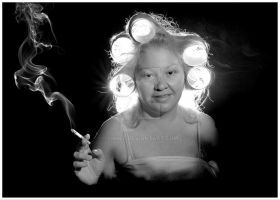 Nitpicking, I would refer the light post - distracting because it's visually appealing and deviates the eyes from the obvious subject. I understand that, but it was so spontaneous that I could not worry too much about the composition. this photo is awersome! style, action....perfect! and the guy is very handsome your friend? My brother! This was taken in a small village in Portugal. Capoeira is Brazilian actually. But thanks! year, i know that capoeira is a brazilian martial art, but as i already said - mestre whom i like a lot live in portugal. wow! Q momento apanhaste tu! Grande foto! I'm sorry that some of the parkour community have been less than courteous to you miss. I love the shot and your brother shows a lovely sense of prowess in the art of movement, just as you do in relation to being able to capture this lovely moment. I enjoy both parkour and photography so this is just amazing. I do apologize again for some of the community's less caring individuals. Yes, indeed they have said some things that I still don't think were appropriate. And the more I learn about parkour, the more I feel that way. But oh well. I'm so glad you liked it.